The Battle of El Alamein (second battle), was one of the most decisive victories in WWII. It was fought between two of the best commanders in World War II, Montgomery for the Allies and Rommel for the Axis between 23 October – 4 November 1942 . The victory of the Allies at El Alamein lead to the surrender of the German forces in North Africa in 1943. 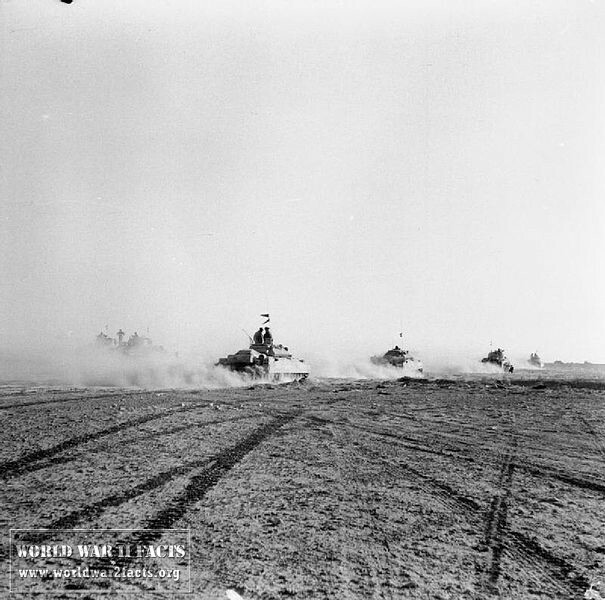 The first Battle of El Alamein occurred between July 1-27, 1942. It was part of the Western Desert Campaign of World War 2 was fought between the British Eighth Army led by General Claude Auchinleck and the Axis forces consisting of German and Italian units of Panzerarmee Afrika (Panzer Army Africa) led by Field Marshal Erwin Rommel. The battle would result in a tactical stalemate but strategic Allied victory in that it halted the final advance by the Axis powers into El Alamein, Egypt. This battle would set the stage for the 2nd and more decisive Battle of El Alamein. Second Battle of El Alamein: 9th Australian, 2nd New Zealand, 1st Armoured, 7th Armoured and 10th Armoured attack: 7am November 4th, 1942. 1st Armoured and 10th Armoured break through and drive towards the coast. 2nd New Zealand Division moves toward Fuka destroying the remnants of Bologna and Trento Divisions on its way. 7th Armoured Divisions encircles Ariete Division, which is destroyed. Axis forces flee. El Alamein is located 150 miles west of the city of Cairo. In 1942 the Allies had many troubles in Europe. Germany had launched it's attack on Russia codenamed - Operation Barbarossa and succeeded in pushing the Russian troops back, the German U-boats were one of the biggest advantages the Axis had over the Allies in the Battle of the Atlantic and it seemed like western Europe was fully in Nazi Germany's grip. 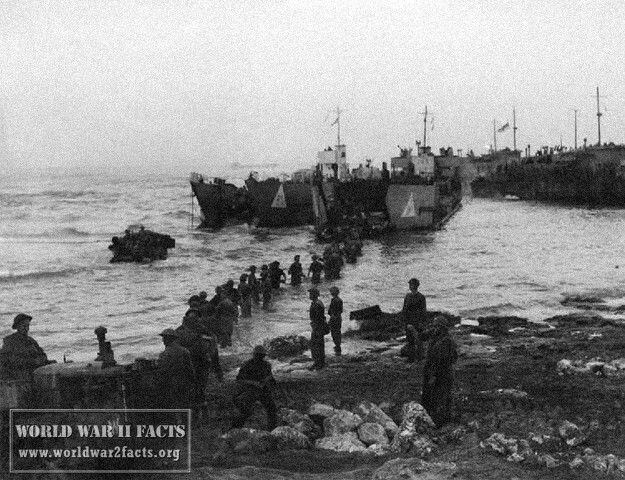 This was one of the main reasons why North Africa was so important for the Allies, if they had lost Africa they would lose one of the last ways to get supplies, the only alternative would have been South Africa and that was not only a much longer route but also much more dangerous because of the harsh weather conditions. Not to mention the psychological effect it would have had if they were to lose the Suez, control of the Suez would have also given the Germans almost unlimited access to the oil reserves of the Middle East. in the eyes of the Allies, actually the German commander had more respect in the ranks of the Allies than their own commander at the time, Claude Auchinleck. In August 1942, Winston in desperate need of a victory replaced Auchinleck with Bernard Montgomery, who was well respected by Allied commanders. Rommel's plan was a surgical attack in the south, which Montgomery guessed because that's what Rommel did in the past but that wasn't the only intelligence he had. He also got some help from some people that worked at Bletchley Park, they managed to get some of Rommel's battle plans and they delivered them to Montgomery. Because of this info 'Monty' as nicknamed by his troops not only knew what Rommel's battle strategy will be but also what the routes of his supply lines were. By August of 1942, Rommel was only getting one third the supplies he needed, Rommel also knew that even though he needed supplies the Allies were getting everything they needed through the Suez, as the situation was only going to get worse it was decided that they should attack as soon as possible, even if that meant that they wouldn't be as well-equipped. Montgomery knew that Rommel was going to attack soon as he was very short on fuel and therefore the campaign Rommel planned would be short. When Rommel attacked, Montgomery was actually sleeping, when he was woken and told that about the attack, he just said "excellent, excellent" and went back to sleep. 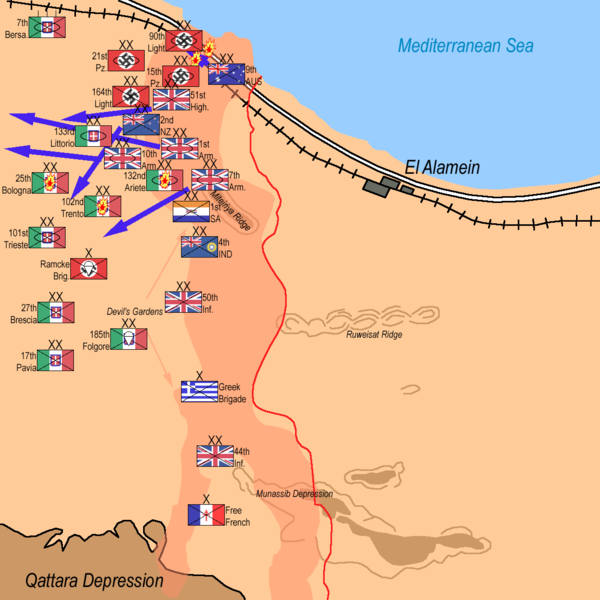 When the German forces arrived at the south of El Alamein they would themselves in the middle of a very nasty surprise, the Allies had placed a huge amount of mines at that very location knowing where they would be attacked. The mines disabled many of the German Panzers and turned the rest of them into sitting ducks. This was already a hint to how the rest of the Battle of El Alamein would go. Rommel ordered the rest of his tanks to the north where he had some help from mother nature. A sandstorm suddenly appeared and provided his tanks with much needed cover, but as soon as the sandstorm was over his forces were hit by Allied bombers, destroying the very place where the Panzers stood, at this point Rommel didn't have much choice but to retreat. 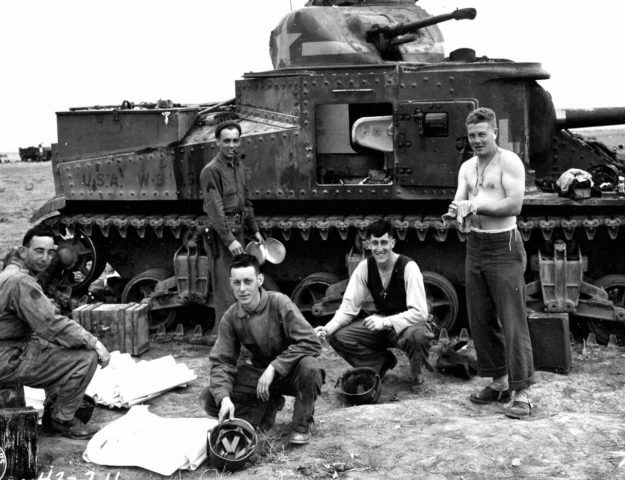 The Allied forces didn't immediately go after them, they waited for more firepower, 300 Sherman tanks. 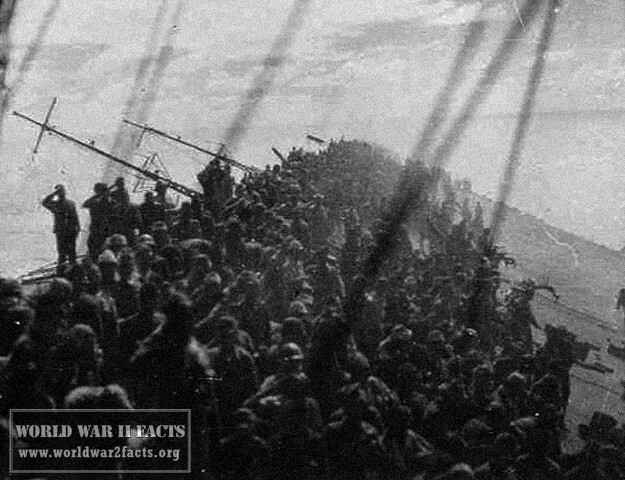 At this point the Germans had 110,000 men and 500 tanks compared men and 1000 tanks of the Allies. The Allies had to clear a 5 mile wide mine field created by the Germans nicknamed 'Devil's Garden'. The Allies wanted just to clear a passage of 24 feet so that a line of tanks could pass through it. This plan ultimately failed, which would later lead to another battle that would be fought between Rommel's men and Australian forces. 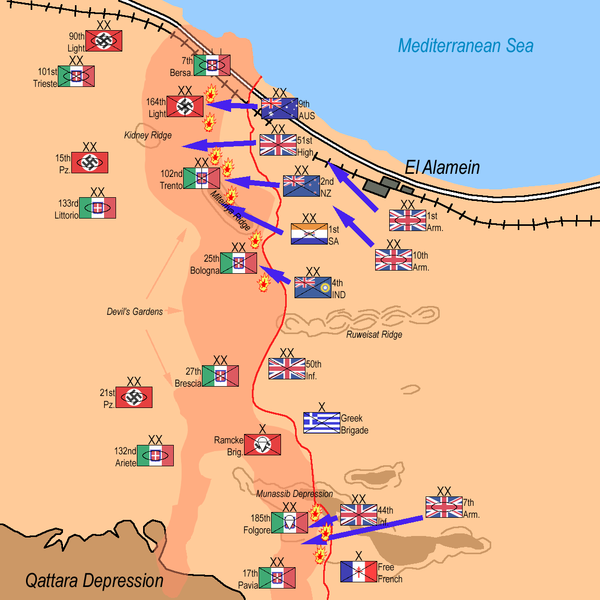 The last part of the Battle of El Alamein was Operation Supercharge. British and New Zealand forces attacked the Germans, who were taken by surprise but once again saved by a sandstorm. Despite his good luck Rommel couldn't win the battle, both his men and his tanks were outnumbered by the Allies. By November 1942, the Battle of El Alamein was more or less over, Rommel knew that he was defeated and began his retreat despite orders from Hitler to fight to the last man resulting in a decisive Allied tactical and strategic victory.